Words by Kevin Doocey on March 29, 2009 . More news now that the crappy tabloid love to write, to try unsettle the Newcastle players and board again. it is reported that should Newcastle be relegated come May, then the mighty NUFC will go into administration and face severe trouble in maintaining the club. We shouldn’t take much from this as more than likely it is more of the brown stuff but then again Newcastle fans will be reading it and starting to worry. 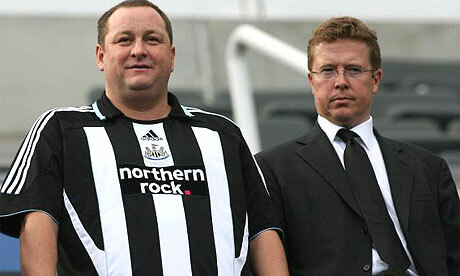 As much as you dislike Mike Ashley some credit is due. Freddy Shepard, who nearly always did guarantee a big name signing every year nearly plunged Newcastle into an early administration. When Michael Owen, Albert Luque, Emre, Scott Parker and Damien Duff all arrived you really had to question where all our finances were coming from but we never took much heed and become adjusted to relying on a big name signing each summer. The real truth of the matter is that Fat Freddy came very close to financial trouble that they wouldn’t be able to recover from and indeed more than likely get relegated due to a points deduction. We are lucky Mike Ashley bought us and that we still are a Premier League team, and should be survive this season we are set for a major squad change. Firstly he said he was to clean up the financial mess at the Toon and then move onto the squad, although reports would suggest otherwise our financial status is believed to be secure and next season, providing we’re still a top flight team Ashley will start to rebuild the team. Words by Kevin Doocey - Life-long Newcastle United fan with occasional opinion pieces on the goings-on at St. James' Park from the island of Ireland. Follow @KevinDoocey. Nothing yet, maybe you'll change that..
© of Kevin Doocey. All images reserved to their respectful owners. Web Development by Moyfox Media.